Start your morning off right with this refined sugar and gluten-free Flourless Banana Pancakes recipe. The recipe is just 3 ingredients and is super easy to make. Even though the pancakes don’t quite taste like a traditional pancake, I think you will enjoy this flourless pancake recipe. Sometimes I see a recipe and it’s so intriguing, I have to try it. 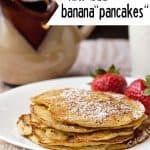 We almost always have overripe bananas and eggs on hand so I really wanted to try this flour-less banana pancake recipe. 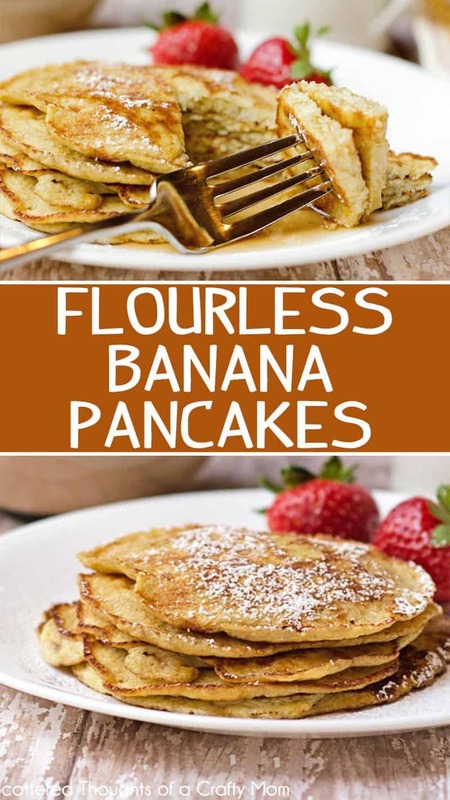 Do flourless banana pancakes taste like regular pancakes? We’re not super adventurous eaters around here, (at least I’m not…) but with basic ingredients like eggs and bananas, you can’t really go wrong. I will say, they don’t quite taste like regular pancakes. The banana pancakes definitely have more of an egg-y taste, but they are pretty darn good! 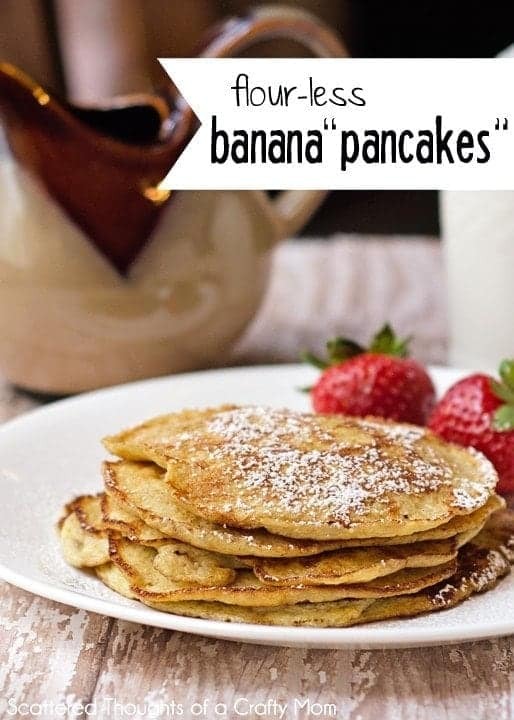 Once I added some sugar free syrup, (you can use whatever kind of syrup you like) I could hardly tell the difference between the flour-less banana pancakes and regular pancakes. Do I need to use baking powder in my flourless Banana Pancakes? 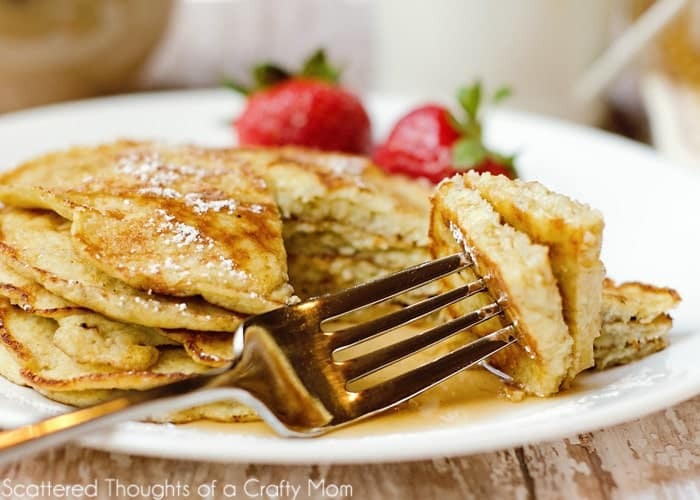 Can I freeze these Flourless Pancakes? Yes, you can freeze these flourless banana pancakes. Start your morning off right with theses this refined sugar and gluten-free Flourless Banana Pancakes recipe. The recipe is just 3 ingredients and they are easy to make. Even though the pancakes don’t quite taste like a traditional pancake, I think you will enjoy these flourless Pancakes. In mixing bowl, mash bananas with fork. Add salt and baking powder, mix until combined. Serve topped with powdered sugar or syrup. These pancakes do not absorb the cooking oil the way regular pancakes do, so you may need to blot the excess grease with a paper towel. They are best served warm. My daughter found a similar recipe on Pinterest and has made them a couple of times. She loves them! I must say your plate of pancakes makes me want a plate of my own right now! Do you eat bananas on keto? Oh my goodness, this sounds delicious. I would love for you to link up to my Inspire Me party that just started. http://www.astrollthrulife.net/2014/04/211th-inspire-me-tuesday.html Hope to see you there. Pinned! This looks fabulous and I love how healthy it is! oh my gosh this looks amazing! I cant wait to try this recipe!! visiting you from We Did It Wednesday link party and now your newest follower! These look amazing! I'll have to try these with my kids! My husband is a newbie gluten-free eater and I'm always looking for good recipes that my kids will eat too. looks delicious, thanks for sharing! That looks so delicious, Jamie-I can't believe there is no flour! I'm pinning this to my low carb board right now! If you have a minute to spare please stop by and join my Say G'Day Saturday linky party-this post would be a fabulous addition! These look great! But when i tried making them we weren't very successful at keeping pancake form…. to be honest we made scrambled pancakes. 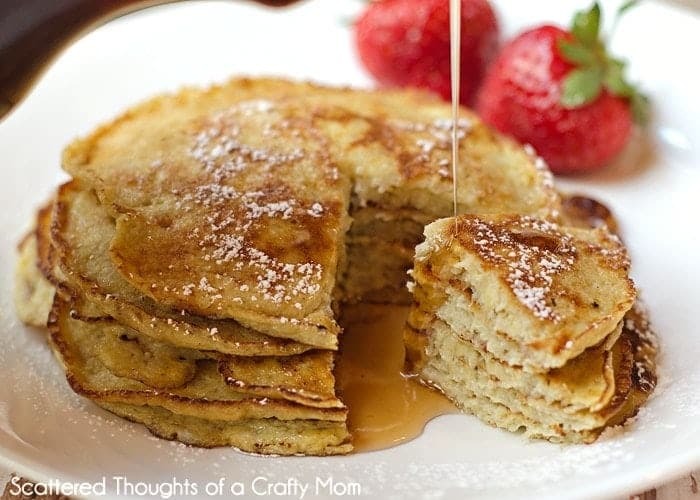 What is your secret to beautiful flourless pancakes? ?… because yours look AMAZING! Maybe your bananas were not large enough and you needed more banana? Also, I mashed my bananas completely with a fork, so there almost no lumps. Did you use the baking powder- maybe you needed a bit more? Or possibly your pan was not hot enough to begin with? The banana pancakes in the photo were from my first batch, though I confess to eating the first couple of pancakes, which were not as pretty as the last few that came out of the pan. If you try these again and are successful, be sure to come back and let us know what you did differently. Hi Jamie, are you using baking powder or baking soda, your recipe calls for 1/4 tsp baking powder, but in your suggestions to Aubri, you're asking if she used the baking soda. They are mouthwatering, gonna try them but wanna make sure I use right ingredients. I'm glad you caught that, it is baking powder, I'll re-reply to the message above so there is no confusion. fantastic recipe thank you so much! That is so good to know, thank you for sharing! I used a fork, but others might try a machine too.